Headway’s built-in Navigation block creates residual styling with UberMenu. To avoid this, we’ll integrate UberMenu via the UberMenu manual integration PHP code within a Custom Code block. To keep UberMenu independent from the Headway navigation system, we’ll use UberMenu’s special theme location. 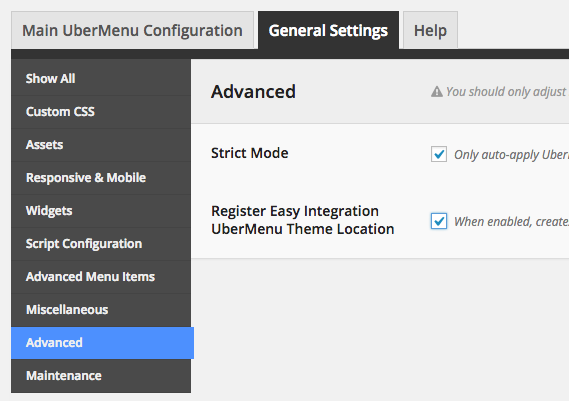 Go to Appearance > UberMenu > General Settings > Advanced and activate Register Easy Integration UberMenu Theme Location. Save your changes. Then go to Appearance > Menus > Manage Locations and assign your menu to the UberMenu [Easy Integration] theme location. Save your changes. In the Headway Visual Editor in Grid Mode, remove the Navigation Block if it already exists (assuming you want to replace it with UberMenu). This will generate the appropriate manual integration code. Copy the PHP to your clipboard. Back in the Headway Visual Editor, click the Content button on the Custom Code block to open the text editor. Paste in the UberMenu Manual Integration Code. Click the Save button to save your layout. UberMenu will now appear on your site. But generally, targeting just your specific block would be better.